This weekend, you need to watch where you’re walking lest you step on something you shouldn’t be stepping on – Easter Eggs, that is, not dog droppings. There will be Easter Egg hunts everywhere – from huge hunts presented by organizations and churches to small family backyard hunts. One thing for sure — there will be a lot more hard-boiled eggs hidden and found than colorful eggs eaten. However, eating will be the main focus at several area Easter events. There are several top-caliber “Easter Brunches” in the area including ones at Winterthur and Longwood Gardens. While these special brunches are not until next weekend, it is advisable to make reservations early rather than potentially being shut out when Easter Weekend arrives. 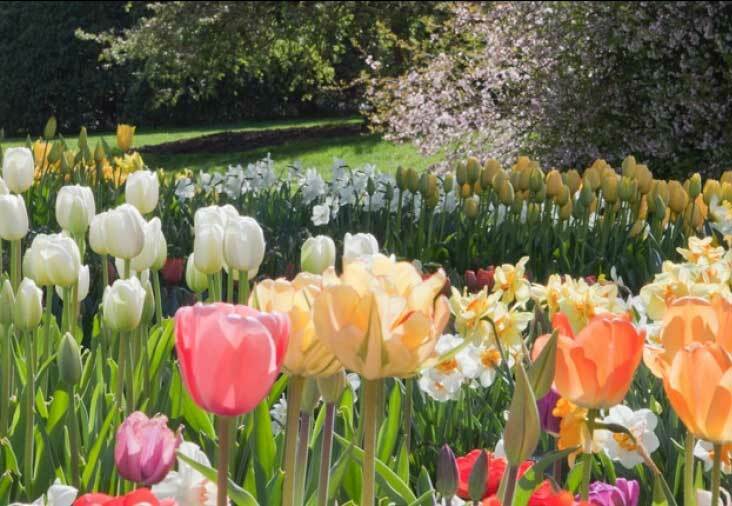 Winterthur Museum, Garden & Library (Route 52 just south of the Pennsylvania state line, Wilmington, Delaware, 800-448-3883, http://www.winterthur.org) will host “Easter Brunch with the Bunny” on April 15 and 16 from 9 a.m.-1 p.m. both days. The Easter Bunny will make several appearances each day starting at 9 a.m.
Tickets are $35.95 per person with children (ages 2-12) at 50% off. Reservations can be made through ccater@winterthur.orgor by leaving a message at 302.888.4826. The Easter Buffet at Longwood Gardens (Route 1, Kennett Square, 610-388-1000, www.longwoodgardens.org) will be held on April 15 and 16 from 10 a.m.-4 p.m. both days. Live music will be presented in the Conservatory from noon-3 p.m. both days. Brunch will be held in Longwood’s 1906 restaurant and will feature lamb ragout and smoked duck quiche. Longwood’s Café will be open from 10 a.m.-5 p.m. with a special menu of lamb, salmon, pasta, soups, and salads. Additionally, a wine and champagne bar will be available at the Terrace Restaurant. 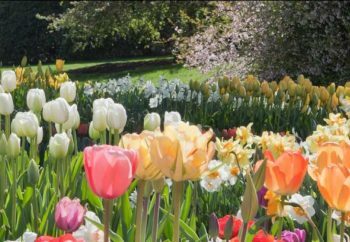 Another seasonal attraction at Longwood Gardens is “Spring Blooms,” which opened on April 1 and is running through May 26. Participants will scour the Winery grounds in search of hidden Easter eggs containing a wide array of treats such as Easter candy, bottles of wine, tickets to future Chaddsford Winery events, free wine tastings, Philadelphia Flyers gifts, couponstowards wine purchases, vouchers for Chaddsford gear (scarves, tee shirts), and glasses of wine. 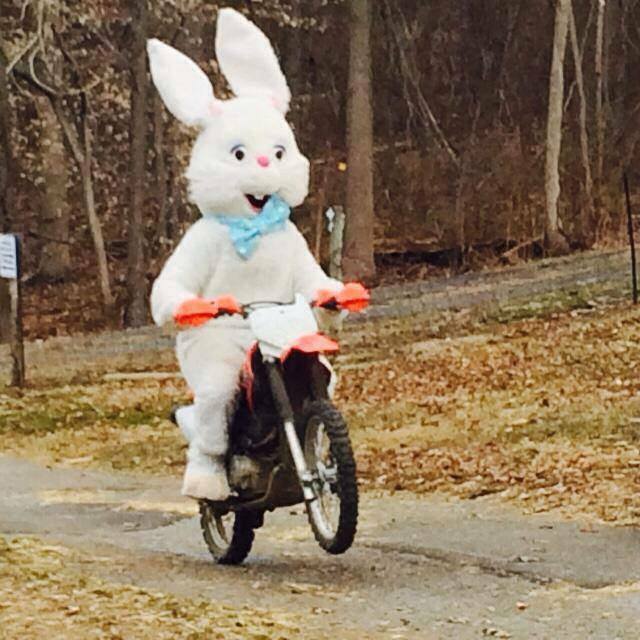 The Easter Bunny at Linvilla. Now through April 15, there will be a special event called “Hayrides to Bunnyland” at Linvilla Orchards (137 West Knowlton Road, Media, 610-876-7116, www.linvilla.com). There are times when the Easter Bunny wants to chill a little bit. So, instead of hopping around, he rides a train. This weekend, the big holiday rabbit will be riding trains all around the area. The Easter Bunny on the West Chester Rail Road. The West Chester Railroad (610-430-2233, www.westchesterrr.net) is running its Easter Bunny Express on April 15 with trains at noon and 2 p.m. each day. 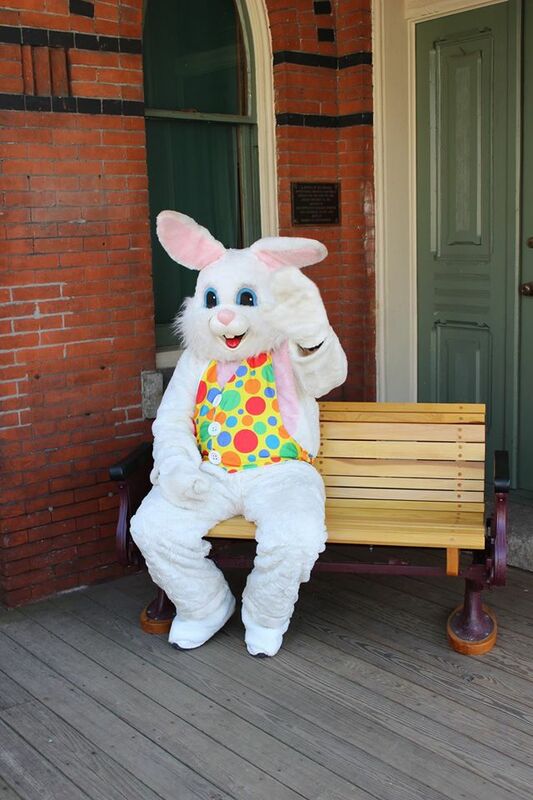 During the 20-minute stop at the historic Glen Mills station there will be plenty of opportunities for riders to take photos with the Easter Bunny. Additionally, Greg Wright and Friends will be playing live music and singing all of your favorite Easter songs. Tickets are $24 for adults, $17 for children (ages 2-12) and $7 for toddlers. The Easter Bunny will also be down in Delaware for trips on the Wilmington and Western Railroad (Greenbank Station, 2201 Newport-Gap Pike, Wilmington, Delaware, 302-998-1930, www.wwrr.com) on April 15. The New Hope and Ivyland Railroad (32 West Bridge Street, New Hope, 215-862-2332, www.newhoperailroad.com) is running its annual Easter Bunny Express now through April 16 with departures at 11 a.m., noon, 1,2,3 and 4 p.m. each day. The Easter Bunny is going to ride onboard the train where he will visit with each child, hand out special treats and pose for pictures. Coach tickets are $32.95 for adults, $30.95 for children (ages 12-plus) and $9.95 for toddlers (under 2). At the Strasburg Rail Road (Rt. 741 East, Strasburg, 717-687-7522, www.strasburgrailroad.com), the special Easter Bunny Train will be chugging down the tracks from April 14-16 with departures starting at 11 a.m. each day. The Easter Bunny will meet and greet all the kids on each train and have a special treat for all of them. Coach fares are $12 for adults and $12 for children (ages 2-11). The Middletown & Hummelstown Railroad (717-944-4435, www.mhrailroad.com) will be running its Easter Bunny Express on April 14 and 15 at 1:30 p.m. each day. Highland Orchards (1000 Marshallton-Thorndale Road, West Chester, www.highlandorchards.net) is presenting “Hayrides to Easter Bunny” now through April 15 from 11 a.m.-3 p.m. each day. 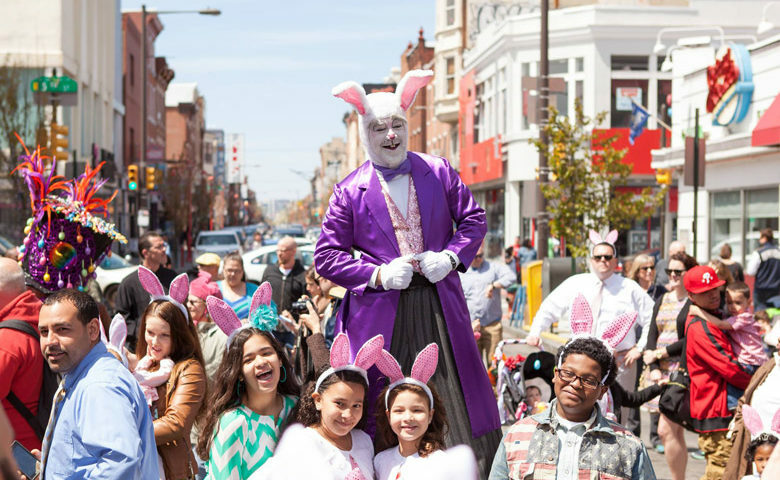 An always-popular annual Easter tradition is the Easter Parade on South Street in Philadelphia (www.southstreet.com). 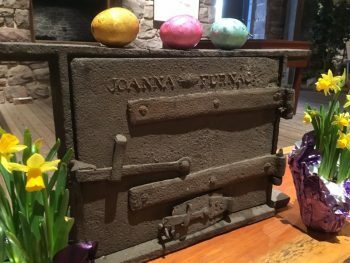 This year, the 86th Annual Philadelphia Easter Promenade will be held on April 16 from 12:30-2 p.m.
From 7 a.m.-noon, visitors to the historic site in Berks County can embark on a special Easter celebration that will take them back to how life existed at the Joanna Furnace Iron Works 200 years ago. The day’s activities will begin with a delicious all-you-can-eat Breakfast Buffet in the Joanna Furnace Stable. Breakfast, which will be served from 7-11 a.m., includes a wide variety of homemade foods. From 9 a.m.-noon, visitors will be able to take part in the “Eggtravaganza” History Tour – a tour that begins with a mystery egg. This special egg will contain a message that will guide participants to one of the site’s historic buildings where a furnace personality will talk about the educational note contained in the egg. After a short visit in this building, guests will be given another egg that will direct them to another part of the iron furnace. Six furnace buildings in all will be discovered during the hunt. An Easter prize will be awarded at the end to each child that completed the tour to each child. Participants will be asked for a donation to participate in the “Eggtravaganza” History Tour. Another inaugural staging of what is hoped to be an annual event will take place on April 15 when the FDR Fest is held in South Philly at FDR Park (1500 Pattison Avenue, Philadelphia). The event, which will run from noon-5 p.m., will kick off the spring season with a day of live music, food, and fun in the park for the whole family. The day’s line-up includes live music from local performers DJ Patty Pat, Kid Felix, and Andorra; food, wine and beer for purchase (including some of Philly’s favorite mobile food vendors The Cow and the Curd, Nick’s Roast Beef, and Farm Truck); and special Easter-themed activities for kids including the Claymobile, petting zoo, special appearance by the Easter Bunny and the popular egg hunt starting promptly at noon. As an added attraction, Wheel Fun Rentals at FDR Park Boathouse will feature paddle boat and kayak rentals for on-the-lake fun plus surreys and two-wheel bikes for visitors to experience FDR Park in a new whole way. The family-oriented event is free and open to all. Rain date is April 22. The Morris Arboretum (100 East Northwestern Avenue, Philadelphia, 215-247-5777, http://www.business-services.upenn.edu/arboretum/index.shtml) is presenting its Japanese Cherry Blossom Festival on April 8 and 15. With the early spring this year, many Yoshino cherries will be in their bloom period during the celebration. The Arboretum’s vast cherry collection includes trees with varying bloom times, and their season can last up to three weeks. This should ensure that Arboretum visitors will enjoy flowering cherries during the festival. The daily schedule this weekend at Morris Arboretum includes “Cherry Walk” (10:15 a.m. and 12:15 p.m. – participants meet at the Garden Railway), KyoDaiko Drumming Crew (10:30 a.m. and noon — Azalea Meadow), Samurai Arts Group (11:30 a.m.), Traditional Japanese Tea Demonstration (1 p.m. — Oak Allée Plaza) and Japanese Elements Tour (2-3 p.m. – participants meet at the Garden Railway). Whitaker is an American sculptor from Utah who has been a working sculptor for more than 40 years. Since the early 1980s, Whitaker has focused on kinetic art, creating “Wind Sculptures” — artworks driven by the wind. His pieces are organic in nature and dependent upon their natural surroundings to provide their movement. They are also intended to make observers think about their surroundings and their own relationship to nature. Admission to Morris Arboretum is $17 for adults, $15 for seniors (65 and older), $9 for students, youth (ages 3-17) and military (active and retired). National Park Week is April 15-23 this year. There are more than 400 National Parks in America. Quite a few of the nation’s most interesting National Parks are located in the Delaware Valley. National Parks include seashores, battlefields, historic homes, archaeological sites, and spectacular natural area. Now that a park has been added in Delaware, there is at least one National Park in every state. On National Junior Ranger Day, which is April 15, parks will invite young visitors to explore, learn and protect the parks. Kids can take part in fun programs and earn a junior ranger badge. Two other events are part of National Park Week — “Earth Day” on April 22 and “Park Rx Day” on April 23. On these National Park Week weekends – April 15-16 and 22-23 — every national park will offer free admission to visitors. On April 23, the park near King of Prussia will host the Valley Forge Revolutionary 5-Mile Run with activities from 8 a.m.-noon. On April 15 from 10 a.m.-2:30 p.m., the park in Valley Forge will celebrate National Junior Ranger Day. During National Park Week, national parks across the country will honor and welcome new Junior Rangers. Youngsters can spend the day in the park taking part in hands-on activities and games and earn their Junior Ranger badge. 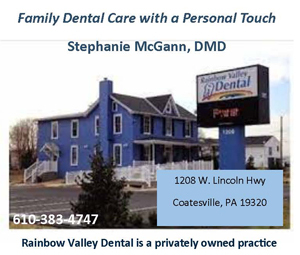 Other nearby National Parks are Independence National Park in Philadelphia, First State National Park in Delaware and Hopewell Furnace National Park, which is located in Elverson. 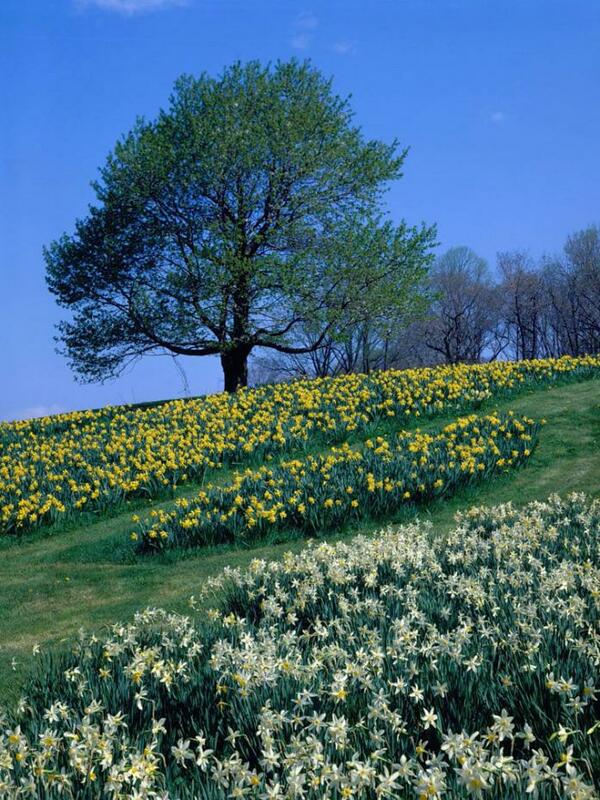 On April 15, there will be a special event called “The Way Springtime Works” Guided Stroll at the Brandywine River Museum of Art (1 Hoffmans Mill Road, Chadds Ford, www.brandywine.org, 610-388-8326). Participants are instructed to meet at the Historic Chadds Ford Schoolhouse (10 Station Way Road, Chadds Ford) for the 2 p.m. start of a leisurely stroll along the Brandywine campus trails. 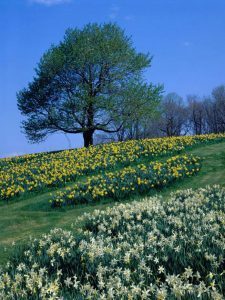 Those talking the scenic walk will be able to take in the sights, sounds, and smells of spring as it begins to unfold. Guides will talk about the signs in nature that indicate spring’s annual return and show examples along the path. After the guided stroll is over, participants are invited to head indoors to assemble a birdhouse or bee house to take home. This event is offered in conjunction with the 2017 Longwood Community Read. Tickets are $20 per child. Children must be accompanied by an adult. Adults are free.